or the full range of genuine Colorbond®. Rhino Infinity Tank Liners are fabricated in-house using a state-of-the-art material, which is exclusive to Rhino Water Tanks.Qualified liner fabricators use the latest welding techniques and high-end machinery to produce liners of the highest quality. 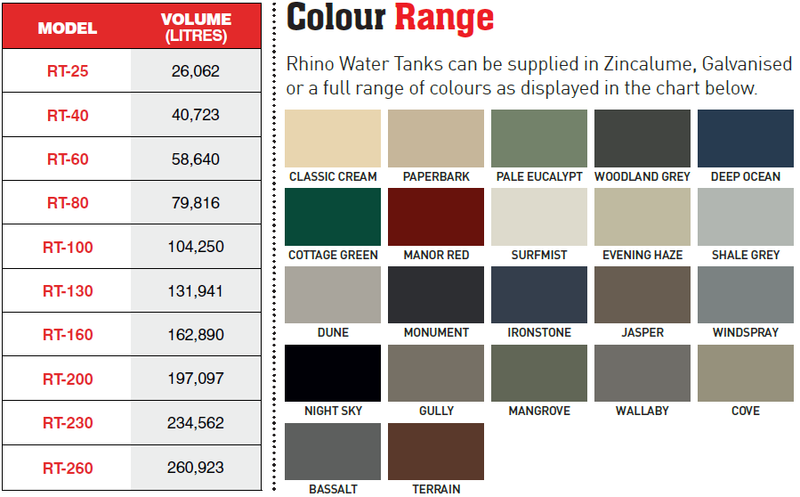 Rhino Infinity Tank Liners are the latest technological advancement in liner fabrics on the world market and are exclusive to Rhino Water Tanks. Our Infinity Liners are made from a state-of-the-art food grade, multilayered material which is also UV treated. The Metallocene film coating is laminated to the existing reinforced polyethylene liner giving extra layers of strength and durability. The development of this new commercial strength liner once again demonstrates Rhino’s commitment to consistently improving its product and reinforces its status as a world leader in tank liner fabrication. If you would like a new tank installed or any more information, please do not hesitate to Contact Us.